The Matrix Monday sometimes series rolls on this month with a look at the 1994 Supergirl solo mini-series written by Roger Stern with internal art by June Brigman and Jackson Guice and covers by Kerry Gammill. 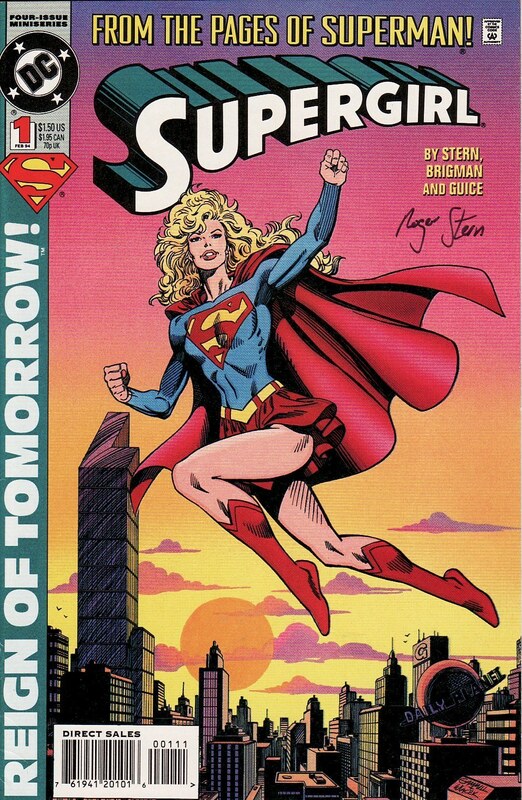 Supergirl #1 had a cover date of February 1994, a busy month in the Superman Family for DC Comics. Coming off the wildly successful Death of Superman , Funeral for a Friend, and Reign of the Superman story arcs, DC decided to showcase some of the heroes who emerged from that historic arc. That month there wasn't just a Supergirl first issue. Steel #1 and Superboy #1 were also on the shelves. During the Death/Funeral/Reign arcs, the Matrix Supergirl character took some big leaps in character growth. She started to act independently, thinking like a hero, and embracing her role in the Superman family. She even started to recognize that maybe Lex Luthor wasn't the purest of hearts. At times, in those stories, she defied him. This mini-series marks a major turning point for the Matrix character. Finally she sees Luthor for the evil person he is. She finally breaks away from him. She starts out on her own with a new mentor. I know ... spoiler alert. But I am giving away the ending just so that you can see how profound that turnaround is given how she acts here. The art in this is also stunning. I am used to Guice inking his own pencils. Here, his lines over Brigman have a nice synergy. I had the luck of meeting Roger Stern at last year's Terrificon and got him to sign these issues. The issue starts with Supergirl apparently breaking into an underground lair of some well-armed organization. Initially, it seems to be some sort of unsavory group - Intergang, Skull, etc. Whoever they are, they are afraid of her, crying out as she just tears through the place. Here you get a very good look at how Brigman/Guice are going to represent Supergirl in this book. Young, lithe, powerful. But this showcases just how powerful she is. But then it turns out that she is being observed during this attack, her powers being measured and catalogued. That shadowy figure in the top panel is pretty obvious. The reddish tinge let's us know right away, this is Lex. What we don't know right now is if Supergirl is aware of his presence or if he is doing this behind her back. 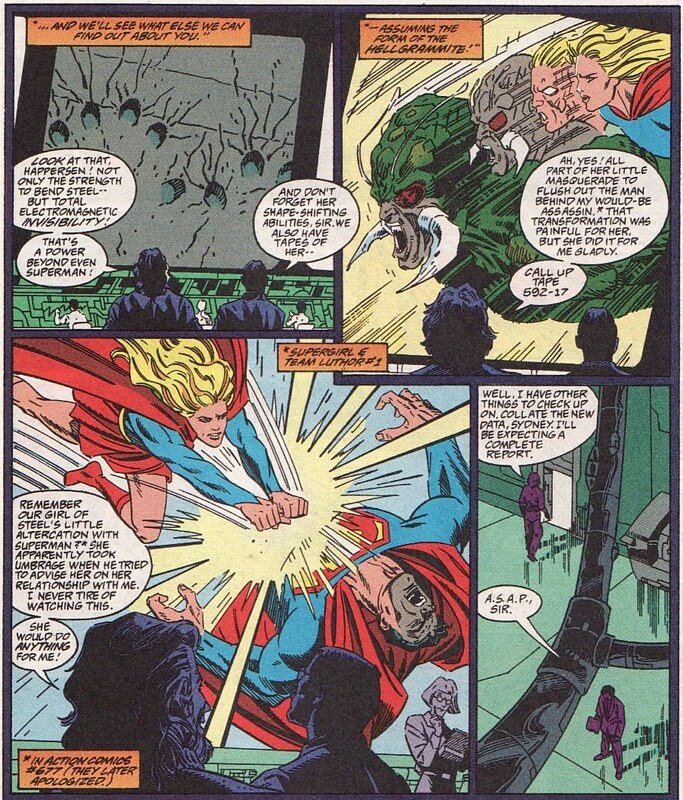 Throughout the big Superman arcs, we have seen Lex gloat in how easily he manipulates Supergirl. So it wouldn't be out of the question for him to be doing this surveillance on her without her knowledge. Remember, this could be someone's first Supergirl comic. So up front, Stern does a good job of filling in some details. This Supergirl isn't related to Superman at all. Her powers are different than Superman's. Even here we learn that the flame throwers output doesn't seem to even reach Supergirl's body. Well, it turns out this was basically a training exercise for Supergirl. She knew Lex was watching. Here he is very impressed with his girlfriend. He seems very intent on studying her and understanding her. And she is more than happy to oblige. She certainly doesn't question his intentions at all. 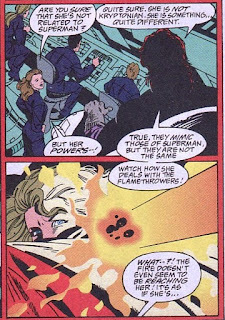 And here we learn that she isn't invulnerable; she projects a psychokinetic shield which protects her from fire and ammunition. And it must be some instinct. And Stern does a real good job of reviewing Supergirl's powers and her history. We hit a bunch of the high points. And Brigman's art really flows nicely. 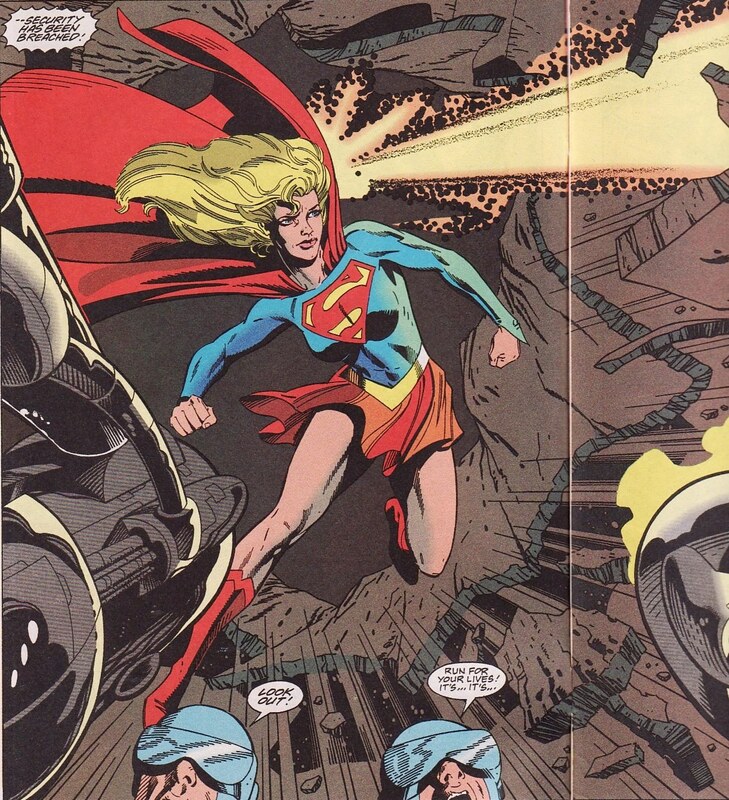 In this test sequence, Supergirl turns invisible, unable to be detected in any way. So it isn't just visual deception. It covers other modes like electromagnetic, infrared, etc. And then Luthor and his toady Happersen review other powers. She can shape change, like she did in Supergirl and Team Luthor #1. And she is superstrong, like when she attacked Superman in Action Comics #677 . Listen to how much Lex congratulates himself for Supergirl's obedience to him. It is creepy. The physical aspect of the test isn't the only part of this experiment. 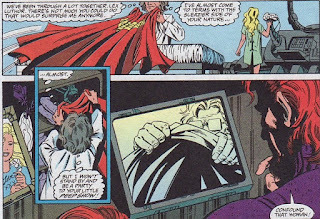 Afterwards, Lex sends Supergirl to Dr. Gretchen Kelley to get examined. Supergirl has been wearing monitors, recording all sorts of biologic data. But now she'll get a true physical exam. Lex even wants to peek in on that. Thankfully, Kelley does the right thing, covering the camera. Again, Stern realizes that this might be someone's first real look at this Supergirl. People who jumped on board with the Death/Funeral/Reign triple feature might not know who she is. So here we get a little information dump by Supergirl to Kelley reviewing her history in short hand. We get how she was created in the pocket universe, battled those Kryptonians, and was brought back to the current Earth, ( see Superman 21, Adventures of Superman #444, and Superman #22). We hear who she was enslaved by Brainiac ( Action Comics #674) and joined Superman in thwarting the Coluan in Panic in the Sky. And we learn how she met this Lex and immediately swooned. I love that last panel. Of course, it riffs on Michaelangelo's Sistine Chapel painting of the creation of man. Given how Supergirl regards Luthor as her maker ... her god ... this seemed very apropos. Nice page layout here buy Brigman and Guice. After the exam, Kelley meets with Lex. She reminds Lex that while Supergirl appears to be a woman, she is actually emotionally much younger. She is innocent, naive. He shouldn't be toying with her in this manner. In some ways, that reminded me of replicants in Blade Runner. Lex sends Matrix out on a mission to Singapore and she seems thrilled to be able to stretch her legs a bit. I like seeing how the Kents welcome their Mae with open arms. Remember, she has had some rough history with them in the past. But like many people, they warn Supergirl about Luthor. 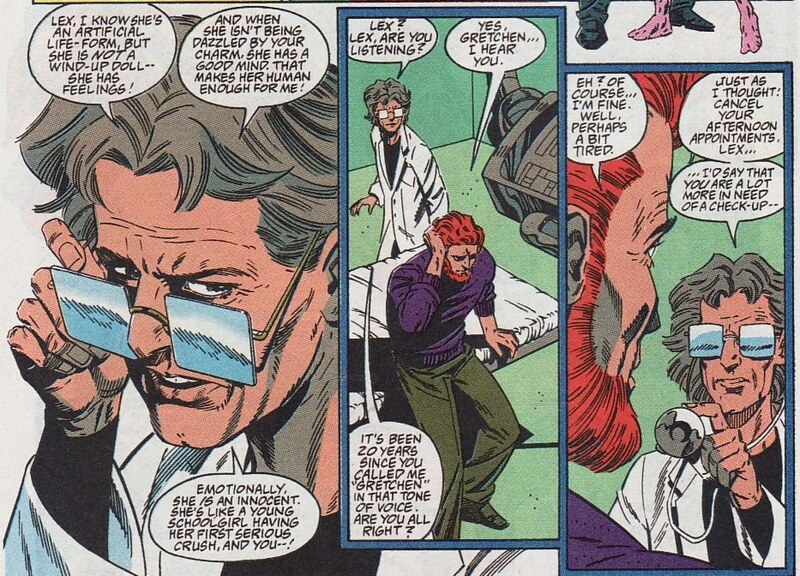 Despite this being 'Lex's son', a different person than his evil 'dad', they feel she shouldn't trust him. There is something about Luthors ... they aren't good people. But Supergirl has bought into his act. You can see how she is upset, disappointed at the Kent's condemnation of her beau. She leaves with a tear in her eye wondering why people can't see the good in Lex that she sees. Great expressive work here, from Pa's non nonsense look while shaking a spoon to Supergirl's crestfallen look at Pa's accusations. 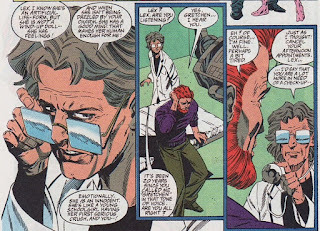 Of course, everyone's concerns about Lex are well-founded. The issue ends with Lex looking at his egg farm of Supergirls that he is growing. I like this issue very much. It is something of a primer on Matrix history. It moves at a nice pace with both action and character moments. 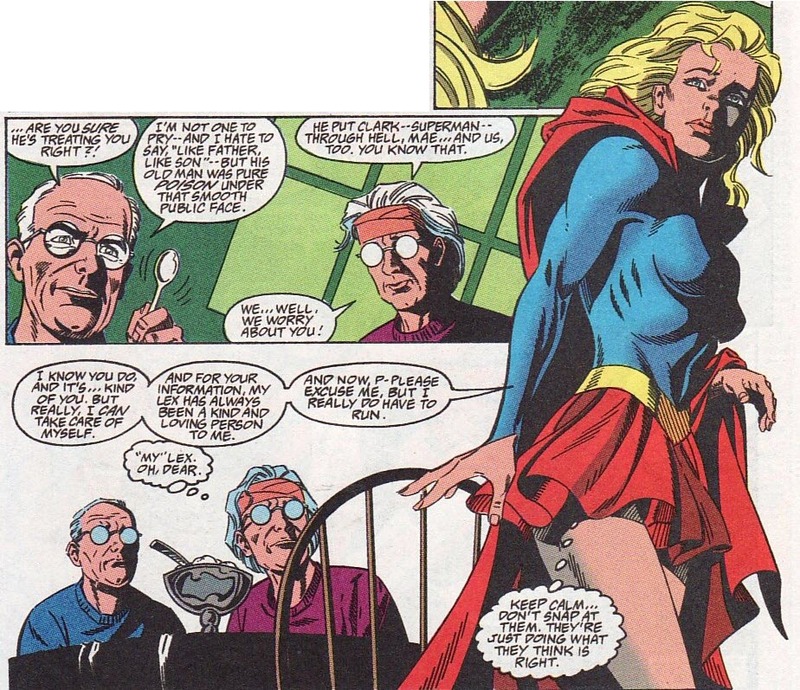 It showcases just how despicable Lex is while emphasizing just how wide eyed and innocent this Supergirl is. And that cliffhanger is ominous. If you are a Matrix fan, this is important and should be sought out. "Remember, this could be someone's first Supergirl comic. So up front, Stern does a good job of filling in some details. This Supergirl isn't related to Superman at all." ...Honestly, the fact that six years after COIE the writer felt he needed to clarify for the new readers' sake that Supergirl wasn't Kryptonian or Superman's relative highlights that replacing Kara Zor-El was doomed to fail. It isn't like he needed to write those exposition lines, since later he wrote a whole page recapping her backstory. So why did he think he needed to make the matter clear in the first pages? Oh, yes. Because he thought new readers would assume Supergirl is Superman's family and they would get confused. 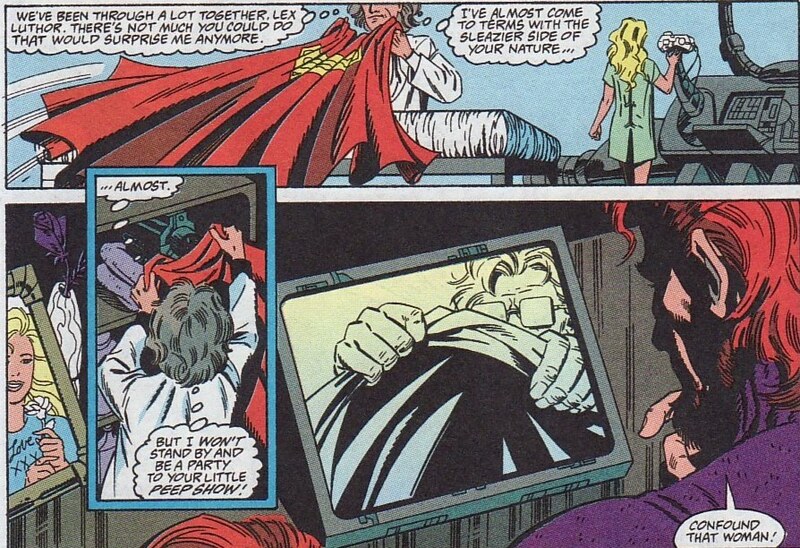 "Lex even wants to peek in on that." You've got to respect Kelley's guts, though. Lex has offed people for way less than that. "The issue ends with Lex looking at his egg farm of Supergirls that he is growing." I said Lex is a creep? Because he IS a creep. Funny. It took some seconds for me realizing that the "old man" Pa was talking about was Lex rather than Lionel. I was born several years before COIE but I didn't seriously get into Superman comics until the 2000's, and this era feels... strange to me. The weird plotlines (Lex is his own son? Okay. And people thinks the Silver Age was silly...), the competent but somewhat dated 90's art and panel layout, the storytelling tone, the secondary characters who were fleshed out but would be discarded for the most part before the end of the decade... yes, not my favorite era. I find ironic, though, that twenty-five years later the Supergirl book is kind of recycling the "Supergirl is cloned by a megalomaniac creep" plot. Off-topic: Anj, Supergirl is being featured in this week's DCSHG Super Short "Street Style" and the "Get To Know" feature (which are uploaded every Thursday and Saturday, respectively). A good chance to learn more about this Supergirl, I guess. 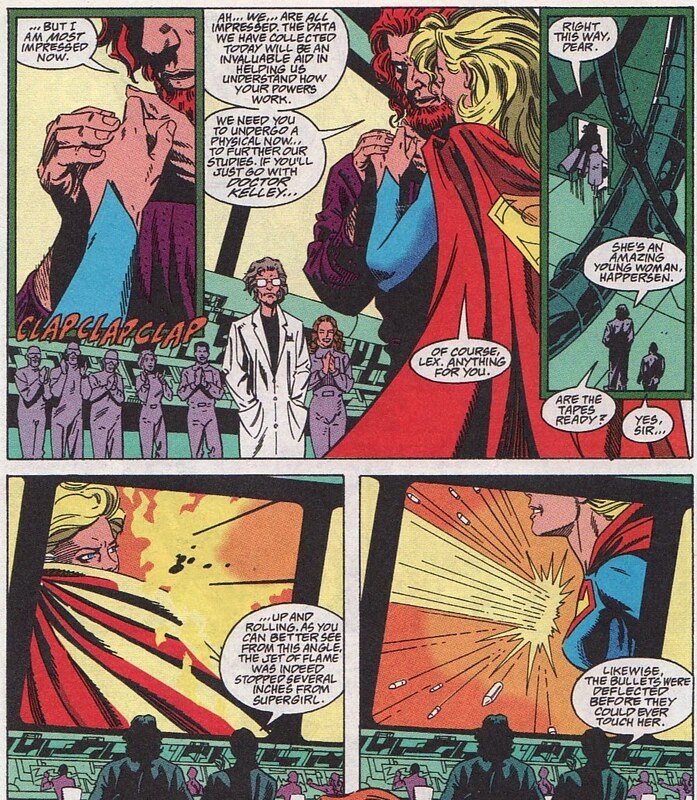 Granted this is heavy handed irony, but I love how DC thought Matrix (who had a sad sick crush on Lex Luthor) was some sort of IMPROVEMENT on Kara Zor El who had seemingly a different BF in every issue of her own title all of them, inane and dubious, but then they weren't Luthor either. This whole Mini is a sort of belated "retrofire" designed to extricate Supergirl from the "romance with Lex" storyline, its too little too late IMHO, but I guess the creatives couldn't have know that, at the time. "I find ironic, though, that twenty-five years later the Supergirl book is kind of recycling the "Supergirl is cloned by a megalomaniac creep" plot." At least this time Supergirl has the good judgement to spit in the megalomaniac creep's face instead of being his girlfriend for a couple of years. I read this mini series when it first came out. I was happy to see Supergirl get a comic of her own, even with a limited run, and overjoyed to see her give Lex the heave ho. 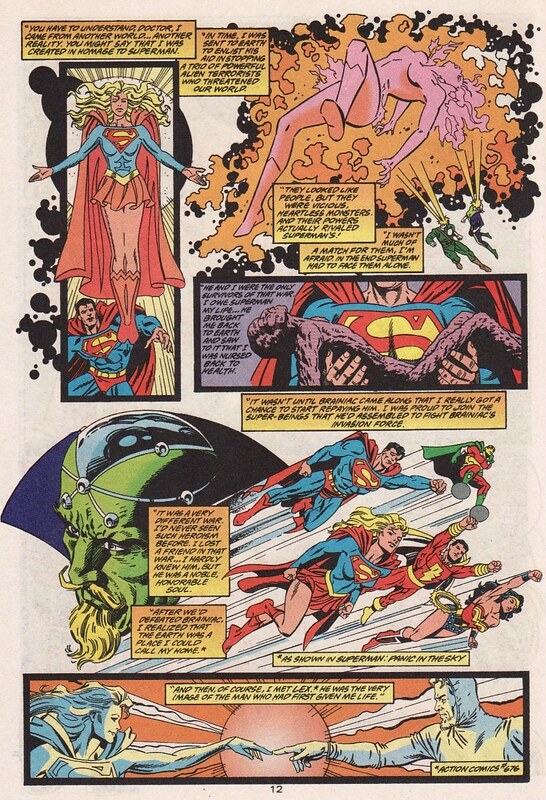 Back then, DC were so insistent that we weren’t getting Kara Zor-El back that it was a question of give Matrix a chance or stick to back issues. I clung to my lovely old comics and enjoyed them, but was also enjoying how the post-Crisis books were, basically, bringing back everything old with a fresh twist. And that’s what Matrix was - not my Supergirl, but a Supergirl*, and this mini-series was an important step along the way. Roger Stern was an A-list writer and he did a fine job here... lovely art, too. 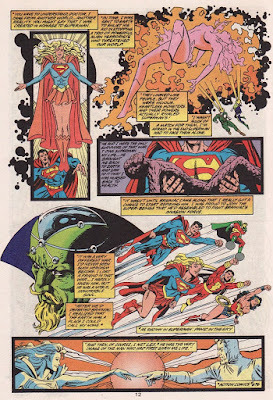 * Matrix was less like Kara than the Totem Supergirl, an artificial creation mimicking Superman... heck, she even began as a redhead, like Totem Supergirl... well, if you first read that story in reprint form!